A magical statement for a magical bottle, be inspired to live your best life with lashings of rainbows and glitter with the mantra "Always be yourself unless you can be a unicorn, then always be a unicorn". 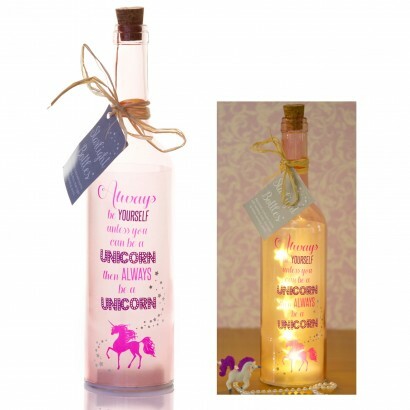 A heart warming message on a pink bottle that's lit with enchanting fairy lights with a holographic star effect, this starlight bottle gives a twinkle to your interiors, and battery operated can be placed anywhere for a spot of daily inspiration. Unicorn message; "Always be yourself unless you can be a unicorn, then always be a unicorn"